Overall national construction employment rose by 20,000 jobs in September, with nonresidential construction employment gaining 12,000 positions, according to an Oct. 22 report by the Department of Labor. The national construction unemployment rate stood at 8.5 percent in September on a non-seasonally adjusted basis, down from 9.1 percent in August and 11.9 percent at the same time last year. Since September 2012, the construction industry has added 193,000 jobs, or 3.4 percent. Of that total, 37 percent is attributable to nonresidential activities, down from 42 percent in August 2013. Nonresidential construction employment rose by 5,200 jobs for the month and is up 23,400 jobs, or 3.5 percent, since September 2012. Residential building construction employment grew by 1,200 jobs last month, which is a positive sign after the sector lost 600 jobs in August. Nonresidential specialty trade contractors gained 6,800 jobs for the month and employment is,2.3 percent (48,000 jobs) higher than at the same time last year. 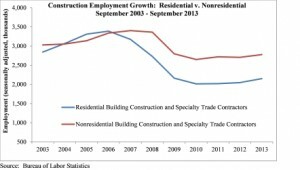 Residential specialty trade contractors added 4,100 jobs in September and have added 88,600 jobs, or 6 percent, compared to September 2012. Employment for heavy and civil engineering construction was up by 2,500 jobs for the month and is up by 18,600 jobs, or 2.1 percent, on a year-over-year basis. 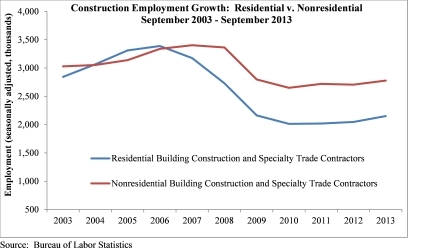 “Heavy and civil engineering construction employment experienced expansion in September, a factor that is often viewed as a leading economic indicator for the nonresidential construction industry,” Basu said. 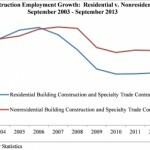 “Indeed, there appears to be a significant level of pent-up demand for new construction. Four years of economic recovery have transpired, gradually improving real estate and financing conditions. Construction materials prices have been generally well behaved and leading indicators, such as the Architecture Billings Index and ABC’s Construction Backlog Indicator, also have turned positive. Across all industries, the nation added 148,000 jobs, falling short of the average 185,000 jobs that have been added per month during the past year. The private sector expanded by 126,000 jobs and the public sector added 22,000 jobs. According to the Bureau of Labor Statistics’ household survey, the national unemployment rate fell slightly to 7.2 percent in September, down from 7.3 percent in August and 7.8 percent in September 2012. This is partially due to a dismal labor force participation rate, which remained at just 63.2 percent, a 35-year low. Allen & Shariff provides Engineering, Construction, and Project Management services to clients worldwide. Allen & Shariff services include MEP Design, Commissioning, General Contracting, Project Management, Green & Energy Consulting, and Project Financing. Allen & Shariff was founded in 1993 as an engineering consulting firm based in Columbia, MD. The company has evolved into a multi-discipline service provider worldwide. The skills of our people, our proven sub-consultants, and our commitment to quality service and client satisfaction make the Allen & Shariff team a valued and trusted partner.